For other places with the same name, see Mezhgorye. 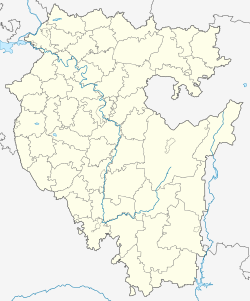 Mezhgorye (Russian: Межго́рье; Bashkir: Межго́рье) is a closed town in the Republic of Bashkortostan, Russia, located in the southern Ural Mountains near Mount Yamantau, about 200 kilometers (120 mi) southeast of Ufa, the capital of the republic, on the banks of the Maly Inser River (a tributary of the Kama River). Population: 17,352 (2010 Census); 19,082 (2002 Census). The closed status of Mezhgorye means that in administrative terms it is subordinated directly to the federal government of Russia. The town comprises two microdistricts (former settlements), located 23 kilometers (14 mi) apart: Tatly (Татлы) and Solnechny (Со́лнечный) (formerly called Kuzyelga (Кузъелга)). This page was last edited on 8 May 2018, at 18:26 (UTC).